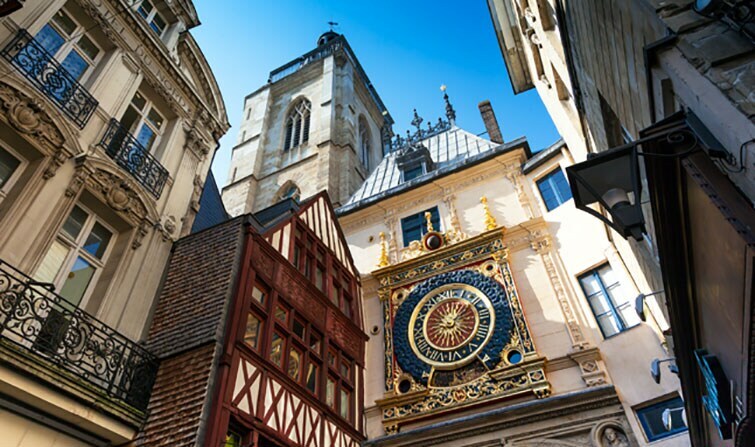 Enjoy this small-group tour through Rouen’s historic streets and explore the top key sites of interest including Rouen Cathedral and the Jeanne d'Arc Tower. Wander through the pretty Old Town to Rue du Gros Horloge. Besides admire famous works by Monet and Rubens in the Museum of Fine Arts. Meet up your guide at your Paris hotel in the morning, and take a seat on board in a comfortable air-conditioned minibus (free WiFi and educational tablets available in the minibus).Then set off into the Normandy countryside on the road to Rouen, considered one of the most beautiful cities in the region. Arrival in Rouen, follow your guide through the cobbled streets and take in top city attractions such as the courthouse, Gothic Rouen Cathedral - made famous in Claude Monet’s artworks - and the Jeanne d'Arc Tower. Stroll through the historic Old Town, where medieval half-timbered houses line the streets. Also soak up the authentic atmosphere along the lively street « Rue du Gros Horloge ». Then, explore the Museum of Fine Arts - home to works by famous artists such as Caravaggio, Fragonard, Monet, Pissarro, Renoir, Rubens and Sisley. Afterwards, admire panoramic views over the well-known Seine River to finally return comfortably to your hotel in Paris.